Review Article Lipids: A Suitable Therapeutic Target in Diabetic Neuropathy? D iabetic Cranial N erve N europathy Commonly, the third, sixth an d /o r fourth cranial nerves fail to function. Bell’s palsy is m ore comm on in diabetes. Involvem ent of cranial nerves is frequently sudden in onset, one sided and painful. Ptosis and in­ terference with lateral gaze develop, but the pupillary reflex remains intact because the third nerve lesion is a peripheral phe­ nomenon. Cranial nerve involvem ent often precedes any overt evidence of m etabolic abnorm ality by m onths or even years. It has been suggested that these particular cranial nerves are m ore vulnerable to injury because of their long intracranial extension. Cranial nerve involvem ent alm ost inevitably abates spontaneously w ithout treatm ent of any kind. Figure 1. Neuropathic foot ulceration. Taken from Implications of Hyperglycemia, p. 20, copyright Pfizer Laboratories. have relative anesthesia of the distal extrem ­ ities, especially of the feet. This may result in injury which is not acutely appreciated, as for example, second and third degree burns of the hands and feet or other types of contact injury which may ultim ately lead to tissue necrosis, gangrene, and need for am putation (figure 1). No current therapy is available for dia­ betic sensory neuropathy. Peculiarly, in some patients, the initiation of diabetic con­ trol with drugs or with insulin may seem to usher in symptoms. In many, if not most patients, these abate with tim e and good dia­ betic control. Diabetic m anagem ent and non-opiate analgesics generally suffice. In re­ cent years sodium dephenylhydantoin 100 mg tid3 or clofibrate 500 mg tid have been claimed effective in some. Figure 2. Atonic bladder from Diabetes Mellitus: Theory & Practice by Ellenberg & Rifkin, figure 39-7 on p. 833. Copyright 1970. Used with permission of McGraw-Hill Book Company. severe autonomic neuropathy frequently experience marked insulin sensitivity with bouts of unexplained and recurring profound hypoglycemia. These patients act as if they have impaired hormonal and metabolic means of averting or coping with hypo­ glycemia. It is suspected but not proven that glucagon secretion and hepatic glucose re­ lease may be deficient owing to malfunction of the autonomic nervous system. Conclusions Consensus holds that diabetic neuropathy is a result of the basic metabolic disturbance in diabetes mellitus. Even so, a careful clinician may encounter clear clinical evi­ dence of diabetic neuropathy in a patient with what appears to be relatively normal carbohydrate metabolism. As diabetic neuropathy may mimic several serious neu­ rological disorders, it is important to ap­ preciate the need to include diabetes mellitus in any differential diagnosis so as to avoid, if at all possible, invasive and potentially noxious diagnostic procedures in these particular patients. References 1. Eliasson, S. G.: Neuropathy and the diabetic foot. The Diabetic Foot. Levin, M. E. and O’Neal, L. W., eds., St. Louis, C. V. Mosby, p. 40, 1973. 2. Ellenberg, M.: Treatment of diabetic neuropathy with diphenylhydantoin. N.Y. State J. Med. 68:2653, 1968. 3. Ellenberg, M.: Diabetic neuropathic cachexia. Dia­ betes 23:418, 1974. 4. Ellenberg, M.: Diabetic neurogenic vesical dys­ function. Arch. Intern. Med. 117:348, 1966. 5. Ellenberg, M.: Impotence in diabetes: the neu­ rologic factor. Ann. Intern. Med. 75:213, 1971. 6. Lash, H.: Silicone implant for impotence. J. Urol. 100:709, 1968. 7. Prockop, L. D.: Diabetic neuropathy. Diabetes Mellitus: Diagnosis and Treatment. Fajans, S. S. and Sussman, K. E., eds., New York, American Diabetes Association, Inc., Vol. Ill, p. 347, 1971. 8. Prockop, L. D. and Pleasure, D. E .: The cellular and molecular basis of neurologic disease. Diabetic Neuropathy. Shy, M., Goldensohn, E., and Apple, S., eds., Philadelphia, Lea and Febiger, 1971. 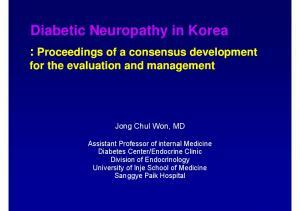 Report "Diabetic Neuropathy. A Review of Clinical Manifestations"